Well – it’s that time of year. You know the time – where everyone is counting down to Christmas or the start of the New Year. This time of year usually starts after Thanksgiving for us Americans. This year, Thanksgiving was quite different. It’s not celebrated in the UK, but my landlady was kind enough to host dinner for me. It was an awesome assortment of English delights like cottage pie and roasted potatoes as well as her own spin on some American classics like corn bread and corn pudding. Although the roots of Thanksgiving are inherently wicked, it has morphed into a celebration of family and a time of reflection. What I am thankful for most is my family back at home who has supported me in every endeavor and every move I have ever made in life. I was also thankful for the opportunity to meet new people and experience living in a different part of the world.Since there is no official Thanksgiving celebration in the UK, there is no official Black Friday shopping. So, I didn’t feel the pressure to go out and shop. 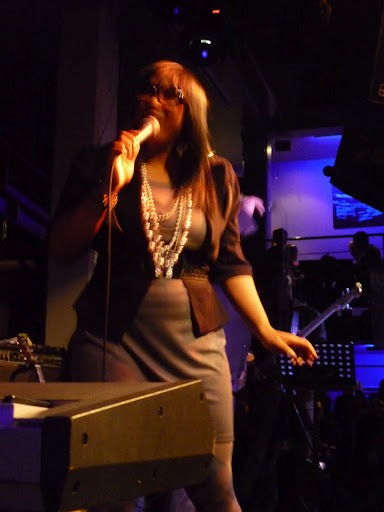 I did go and see Kindred the Family Soul in Concert at the Jazz Cafe. They are an energetic duo and have matured over the years as music artists. (The picture for this post is Aja from Kindred). Seeing Kindred made me think about home (since they are from Philadelphia) and I began a little countdown of my own – the countdown until I come home. I never thought I would be counting down to come home. I don’t think that I have ever counted down to come home. I remember staying in St. Thomas when I was 16 and extending my stay because I didn’t want to leave. Back then, the modes of communication were quite different. There was no e-mailing, Facebook, Skype, etc. I was less connected to my friends and family and yet I wanted nothing to do with them (I guess that’s called the teenage years). Now, 16 years later, I find myself alone in this abyss. I will admit the school program wasn’t what I expected and I found myself struggling. I wanted to quit on several occasions and go home. After talking to several people on different occasions, I felt renewed and am determined to stay the path, but I can say it hasn’t been an easy few months. My new goal is not to focus on my school experience, but focus on the experiences of meeting people, seeing some new sites, and getting more stamps on my passport. So what am I counting down to? The day I come home and can devour some Wawa hoagies, iced tea without carbonation, and people who say please and thank you on an almost regular basis! !